VietPress USA (Feb. 8, 2018): Today on Feb. 8, 2018 is the deadline for U.S. Senate to vote a bill for full budget of US$140 Billion for 2018 and end the government shutdown. But it's regret that Senate didn't come to a bipartisan agreement. Therefore the government is now shutdown again. WASHINGTON (AP) -- Lawmakers were striving in the pre-dawn hours to reopen the federal government, shuttered since midnight after a rogue Senate Republican blocked a speedy vote on a massive, bipartisan, budget-busting spending deal. Kentucky Sen. Rand Paul, protesting the return of trillion-dollar deficits on the watch of Republicans controlling Washington, blocked a vote on the approximately $400 billion spending measure, which is married to a six-week temporary funding bill need to prevent the shutdown and provide time to implement the budget pact. 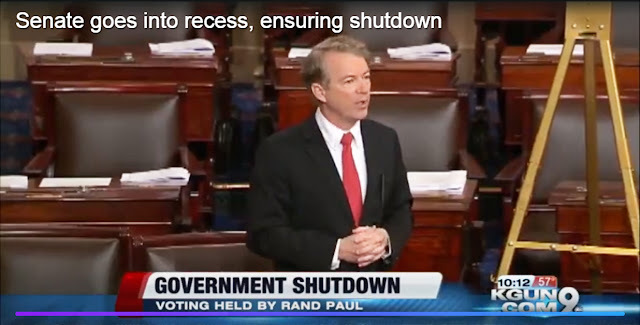 Paul pushed a set of Senate votes into early Friday. The measure, backed by the Senate's top leaders, was expected to sail through the chamber, but the situation was dicey in the House, where liberal Democrats and tea party conservatives both swung into opposition. It also would increase the government's debt cap, preventing a first-ever default on U.S. obligations that looms in just a few weeks. Such debt limit votes are usually enormous headaches for GOP leaders. The partial shutdown — the military and essential workers would remain on the job regardless — was the second in less than a month. Paul repeatedly held up votes on the budget plan, futilely seeking a vote on reversing spending increases. As the clock hit midnight, Office of Management and Budget Director Mick Mulvaney immediately issued an order to close non-essential government operations. Mulvaney told federal agencies they should execute their contingency plans and instructed federal employees to report to work Friday to "undertake orderly shutdown activities." After Senate action, the House vote could come before dawn, making the shutdown a short one. At the White House, there appeared to be little sense of concern. Aides closed shop early in the night, with no comment on the display on the Hill. The president did not tweet. Vice President Mike Pence, in South Korea for the Winter Olympics, said the administration was "hopeful" the shutdown would not last long. But frustrations were clear in both sides of the Capitol, where just hours earlier leaders had been optimistic that the budget deal was a sign they had left behind some of their chronic dysfunction. Senate Democrats sparked a three-day partial government shutdown last month by filibustering a spending bill, seeking relief for "Dreamer" immigrants who've lived in the country illegally since they were children. This time it was a Republican's turn to throw a wrench in the works. Paul brushed off pleas from his fellow Republicans, who billed the budget plan as an "emergency" measure needed for a depleted military. "We will effectively shut down the federal government for no good reason," said Sen. John Cornyn, as his requests to move to a vote were repeatedly rejected by Paul. "I didn't come up here to be part of somebody's club. I didn't come up here to be liked," he said. House GOP leaders said they were confident they had shored up support among conservatives for the measure, which would shower the Pentagon with money but add hundreds of billions of dollars to the nation's $20 trillion-plus debt. House Democratic leaders opposed the measure — arguing it should resolve the plight of Dreamers — but not with all their might. House Speaker Nancy Pelosi, D-Calif., asked Speaker Paul Ryan in a Thursday night letter to promise he would bring a bipartisan immigration measure sponsored by Reps. Will Hurd, R-Texas, and Pete Aguilar, D-Texas, up for a vote. Ryan didn't immediately respond. He said again Thursday he was determined to bring an immigration bill to the floor this year — albeit only one that has President Donald Trump's blessing. At a late afternoon meeting, Pelosi made it plain she wasn't pressuring fellow Democrats to kill the bill, which is packed with money for party priorities like infrastructure, combating opioid abuse and helping college students. Still, it represented a bitter defeat for Democrats who followed a risky strategy to use the party's leverage on the budget to address immigration and ended up scalded by last month's three-day government shutdown. Protection for the Dreamers under former President Barack Obama's Deferred Action for Childhood Arrivals program, or DACA, expires next month. "We're not going to get DACA as part of this," said Rep. John Yarmuth of Kentucky, the top Democrat on the Budget Committee. "So if we can negotiate a deal like I think we've gotten that essentially meets every other one of our priorities then I think that's where a lot of the Democrats are."